While the American-manufactured Thompson submachine gun is frequently associated with the early 20th century incarnation of the Irish Republican Army (IRA), many people are surprised to learn that the weapon actually played little to no role in Ireland’s War of Independence, a struggle conventionally dated from January 1919 to July 1921 (though the full conflict both predated and postdated that period). Instead the “Tommy Gun” was very much a weapon of the country’s subsequent counterrevolutionary Civil War of 1922-23, where it was deployed both by the IRA and its breakaway rival, the Irish National Army (the INA; better known as the Free State Army). The origins of the weapon go back to the middle of the First World War and the enterprising efforts of John T Thompson, the Chief Engineer of the Remington Arms Company, and the business tycoon, Thomas Fortune Ryan. The Kentucky-born Thompson was a former Director of the Small Arms Division of the United States’ Ordnance Department, while the Virginia-raised Ryan was a late-joining member of Clan na Gael (CnaG), the North American wing of the Fenian movement; a global revolutionary organisation represented in Europe by the Irish Republican Brotherhood (IRB). Together they founded a new arms manufacturing company in 1916, the Ohio-based Auto-Ordnance Corporation, with the aim of creating a semi-automatic rifle or “Autorifle” for the US Armed Forces. The project was given an added impetus when Thompson was appointed a Brigadier General and the Director of Arsenals for the United States Army in 1917, supplying the American Expeditionary Forces (AEF) in France during the latter part of the Great War. However, when the initial concept was found to be technologically impractical the inventor and his small team of engineers, Theodore H Eickhoff, George E Goll and Oscar V Payne, hit upon the idea of a weapon for close-quarters fighting on the Western Front, using the existing .45 ACP (Automatic Colt Pistol) round. In a dramatic flourish they called their first prototype the “Annihilator I”. Around the same time, a very similar idea by designers in Germany led to the introduction of the long-lasting MP 18 submachine gun in early 1918, where it was used with devastating effect by Sturmtruppen or “assault troops” during a last ditch offensive by the Central Powers known as Operation Michael. Unfortunately for Auto-Ordnance Corp, the end of World War I in November 1918 removed the immediate need for a close-range automatic gun among the armies of the Entente Powers. Despite favourable press for the company’s successor prototype, the “Model 1919”, and successful demonstrations at the National Rifle Matches at Camp Perry, Ohio, in August 1920, attempts to sell the gun in significant numbers proved futile. Only ten weapons were sold to the New York City Police Department while the US Marines acquired a handful for tests at Quantico, Virginia. However, still hopeful of potential sales following the publicity during the summer, the firm contracted the Colt Patent Firearms Company of Hartford, Connecticut, to begin the manufacture of 15,000 Thompson submachine guns in March of 1921; the vast majority under an upgraded designation: Model 1921 (M1921). Irish interest in these developments was intense with the millionaire Thomas Fortune Ryan putting the company’s chief seller, George G Rorke, a former American soldier and President of the Protestant Friends of Irish Freedom, in contact with the multi-talented Harry Boland as early as July 1920. The latter figure was a TD or elected deputy in Dáil Éireann, the legislature of the revolutionary Irish Republic in Ireland, its Special Envoy to the United States and a senior member of the IRB. In November of 1920 Boland sent a copy of the Popular Mechanics magazine with a two page feature on the Thompson to the General Headquarters (GHQ) of the Irish Republican Army in Dublin, where Michael Collins, the Director of Intelligence and Minister of Finance in the Government, and Richard Mulcahy, the Chief of Staff, ordered further enquiries. In January 1921 Clan na Gael set about ordering one hundred guns through George G Rorke and a second arms dealer in Washington DC, Frank B Ochsenreiter, using a mixture of its own funds and American-raised monies released by the Government of the Irish Republic from the First and Second Dáil Loans (the legal adviser for the sale of the Irish “bond-certificates” in the US was the lawyer Franklin D Roosevelt, the former Assistant Secretary of the Navy in the administration of Woodrow Wilson and an unsuccessful vice-presidential candidate for the Democratic Party). The buyer in both cases was one Laurence de Lacy, a CnaG agent operating under the noms de guerre of Frank Williams and Laurence Pierce. He received the first weapon in his purchase – and the sixth one manufactured under the M1921 designation – in April 1921 while another CnaG front, a Captain George T Wise of the US Marine Corps, took a delivery in Chicago of two guns in a separate deal that March. These three Thompsons were quickly dispatched to Ireland with two instructors: Major James J Dineen and Captain Patrick Cronin, former infantry officers of the United States Army who had both served in wartime Europe (Dineen was also a detective-sergeant and skilled small arms instructor with the Chicago Police Department). The duo eventually led several training camps for the IRA while living in a safehouse in Dublin, later joining the splinter known as the Irish National Army in 1922. The guns themselves were tested on the evening of the 24th of May at a soundproofed underground firing range, an old cellar at Marino, where their percussive power shocked the gathered officers of the GHQ Staff. In fact, the first person to fire the weapon was Tom Barry, the legendary flying column commander with the 3rd Cork Brigade, who was cajoled into testing the gun by the other slightly overawed observers, including Collins. Over the course of the next few months, Clan na Gael built up a cache of several hundred Thompson submachine guns at a discrete warehouse on Lafontaine Avenue in the Bronx district of New York City, using officers of the NYPD to facilitate the movement of weapons, ammunition and personnel. It even took to testing some of the guns at the local armoury of the Fenian-originated 69th Infantry Regiment of the US Army, readying them for transport to Ireland. In the meantime over fifty weapons reached the country in smaller batches. These came from such diverse sources as Michael Sheehan, the Sheriff of San Mateo County in California, whose nephews were volunteers with the West Limerick Brigade of the Irish Republican Army, and the American Railway Express Company of New York, an entirely fictional business front. Most if not all of the guns were smuggled onboard the passenger and cargo ships S.S. Celtic and S.S. Baltic of the B&I line, travelling from New York to the British city of Liverpool. From there they were transported to Ireland, passing through the United Kingdom’s naval blockade, in an operation organised by a specialist unit of the IRA’s highly active Liverpool Brigade, known as Q Company. Unfortunately in June 1921, just as the bulk of the weapons were about to be smuggled to Ireland, they were discovered onboard the East Side, a Cosmopolitan Line freighter chartered by the Irish White Cross, an important Quaker-managed relief agency, which was scheduled to sail from New York to Dublin with a mostly Irish crew. While the exact reason for the discovery is still unknown, the most likely cause was an accidental find involving the non-Irish captain or another crewman (later claims of British espionage are unlikely). Quickly alerted, US officials descended on the scene at Pier Two in Hoboken, New Jersey, including agents of the Federal Bureau of Investigation (FBI) led by a young J Edgar Hoover. A thorough search of the ship discovered 105 unpacked Thompson submachine guns, 495 packed weapons, 289 large boxes of magazines, one small case of cartridges and 175 other packages containing assorted military equipment. Several men were arrested and eventually charged with breaking American neutrality laws, including the vice-president of Auto-Ordnance Corp, Marcellus H Thompson. Embarrassingly for the US authorities the owner’s son was also the husband of Dorothy Harvey, the daughter of George Brinton McClellan Harvey, a shareholder in the firm and the US Ambassador to London. The weapons were impounded pending trial, though all of those taken to court either had the charges dropped against them or were found not guilty when it was revealed that the relevant export legalisation had lapsed. Additionally, Washington had no real interest in pursuing cases against well-connected individuals and a revolutionary cause that many Americans were in sympathy with (including many Democratic members of Congress). So the matter was quietly brushed under the carpet and the weapons were eventually returned to their nominal owners after much bureaucratic wrangling in 1922-25. Consequently, as a result of the losses in the United States, only a handful of actions involving the use of Thompson submachine guns occurred in Ireland before the Irish-British Truce of the 11th July 1921. On the morning of June 16th 1921 a troop-train containing 300 soldiers of the 2nd Battalion, Queen’s Own Royal West Kent Regiment, newly arrived from troubled Upper Silesia in Central Europe, was on its way out of Dublin to take up garrison duties in the Curragh Camp in County Kildare, the largest British Army base on the island since the late-1800s. In the Drumcondra suburb of the capital a small detachment of volunteers from the specialist Active Service Unit (ASU) of the Dublin Brigade, under Brigadier Oscar Traynor, had taken up positions on St. Brendan’s Road/St. 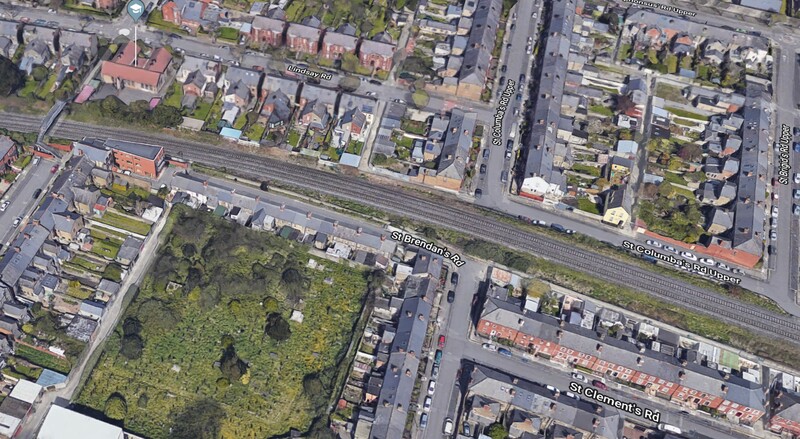 Clement’s Road and St. Columba’s Road Upper (where it meets St. Bridget’s Road) with the railway line between them. Others were waiting where a footbridge spanned the tracks from the Claude Road to a narrow avenue off the Lindsay Road. The guerrillas were armed with Mills bombs (a type of hand grenade), pistols and two Thompson submachine guns received that morning and which neither firer was familiar with. Other volunteers ordered locals to evacuate the streets or to shelter at the rear of their homes and premises. As the train passed through the ambuscade at 8.30am the ASU volunteers opened fire, the grenadiers hitting it first, two explosions taking place inside the slow-moving carriages, one underneath and several more to the sides. The pistols and Thompsons followed up, though only one submachine gun worked as the other jammed, hitting the train with 60 rounds from a heavy 100 round ammunition drum as it accelerated under the bridge – men shooting down through the roof – and out of range. Despite British claims that the soldiers did not return fire, for a lack of targets or a fear of hitting innocents, journalists discovered a number of neighbouring homes pockmarked with rifle bullets. When the train screeched to a halt at Kingsbridge Station (now Heuston Station) some time later eyewitnesses described pandemonium. The engine and the leading four carriages were scarred with bullet, shrapnel and scorch marks, panicked soldiers and officers were met by local counterparts and quick-marched to the Phoenix Park, across the River Liffey, away from public scrutiny. Several ambulances were observed attending the scene and though the British only admitted two sergeants and one private injured, one fatality was recorded much later, a William T Saunders of London killed by grenade fragments. While the operation was a propaganda coup, shocking the British Occupation Forces, the weapons were only partially successful due to the volunteers lack of training. However the sudden appearance of the Thompson submachine gun in Ireland and the subsequent revelations in the United States undoubtedly served to undermine the United Kingdom’s already crumbling determination to continue the fight against the “terrorists”. Several more attacks using Thompsons were to follow, including another ambush of a troop-train at Ballyfermot, Dublin, on the 8th of July, which set the carriages on fire, adding to the sense of a spiralling military crisis. Instead of hardening attitudes among the UK authorities the climactic events of the summer of 1921 accelerated London’s secret negotiations with the Government of the Irish Republic, leading to a nation-wide ceasefire some weeks later. In subsequent months another 158 Thompsons made their way to Ireland, landing in various parts of the country as the British noose around the island began to slip. These were to be joined by hundreds more in the late 1920s and 1930s, mainly from the retrieved East Side consignment. In many ways the discovery of the East Side arms shipment in the US in 1921 paralleled the same impact the discovery of the Eksund arms shipment in France had in 1987. The latter revelation, of a significant rearmament programme by the (Provisional) Irish Republican Army in the late 1980s, was one of several key factors which pushed the Conservative Party government of prime minister Margaret Thatcher (and her successor, John Major) towards backchannel and then tentative direct talks with (Provisional) Sinn Féin in 1989-94. An eerie reminder of the repetitive or circular nature of the bloody colonial history between Ireland and Britain. While no definitive proof has ever been found, there is a strong suspicion that Clan na Gael and the Government of the Irish Republic contributed indirect funding to the development of the Thompson submachine gun in 1919-1920, possibly through Thomas Fortune Ryan. Certainly Marcellus H Thompson was aware of the interest of the “Irish crowd”, as he named them, shortly after Harry Boland arrived with a large diplomatic group in the United States in June 1919, led by the President of the Irish Republic, Éamon de Valera. With powerful connections in US society, the CnaG lobby could have opened many lucrative doors for the business, quite apart from their own purchases. If so, this would have been the second time that Irish-American revolutionaries had financed significant innovations in military technology in less than fifty years. The previous example was the manufacture of The Fenian Ram, the world’s first military submarine in 1881. Officially named The Holland Boat No. II, the prototype was commissioned in the United States by the Fenian Brotherhood of America (FBA), the forerunner of Clan na Gael, and paid through its donor-subscribed Skirmishing Fund. Excellent stuff Sionnach! Typical student, lounging around up to no good! The Casino in Marino where the Tommys were tested has a bit of a feature on them (although tis closed now til 2019 I think). There are a few bits of information on the testing and on the general revolutionary background of the area on their excellent website though. Yeah, I was going to include some of the BMI eye-witness testimonies to the test firing of the Tommy guns. Apparently the presumed soundproofing wasn’t up to the job and the whole neighbourhood heard the bursts of gunfire. I always thought that a trip to the major ambush sites around the city would make a good day out. There’s a business opportunity for the 1916 Rebellion Walking Tour guys! +1 bradhar, this is great, thanks ASF. Fascinating stuff – thank you very much for posting this truly superb story. The more I discover in our history about the extraordinary lengths that our forebears went to in the struggle for Irish freedom – against all the odds – the more I am in awe of their exceptional resolve and courage.